When you work for a Fortune 500 company and they decide to close their production lines and move elsewhere, do you move with your job, or stay put and hope you can find work elsewhere? When you went to work you had the hope that the company’s size would help insure stability, but this turned out not to be so. If you are a young, single person the opportunity to move might be seen as an exciting adventure and a natural part of the modern workplace. If you have a family, maybe aging parents that need to be taken care of or other obligations, relocating may not be an attractive option. Historically, wholesale relocations of the younger portion of the working population has been a defining characteristic of the American worker. “Go West young man,” a phrase attributed to newspaper man Horace Greeley, was commonly repeated in the 1800s and only reinforced the migrations to new lands in the western parts of the new Republic that existed in the previous century. Even earlier migrations were from the New England states South as new lands opened in Georgia and in the Louisiana Purchase. In more modern times there was the migration of largely black labor North seeking a better life than that afforded by sharecropping in the Jim Crow South. Historical precedents aside, this is your life, your family , your home town and your dislocation. For years, maybe decades, you have put down roots in this community. Your kids are attending good schools, you have an active church life, perhaps you are involved in social or civic organizations and have risen to a leadership position or become an elected official. The deeper your community roots, the harder it is to leave. The strongest ties of all may be to aging family members or perhaps to help support the family business – like the farm or ranch you grew up on. It’s struggling too. Without your help, both financially and with your labor, this property will pass out of family hands and your children and grandchildren will lose their inheritance. Perhaps you have had fleeting thoughts about starting your own business and being your own boss. Faced with an immediate decision to move with your job or stay and risks being unemployed for an unknown period, being forced into a hasty start-up operation is not a desirable situation. Perhaps you don’t really like what you see as your most obvious business option, but you do not have time to find a more appealing choice or get the training and/or certifications to make that job a success. You wish that you had thought about developing some business options years before and were not being pushed into directions you do not want to go. 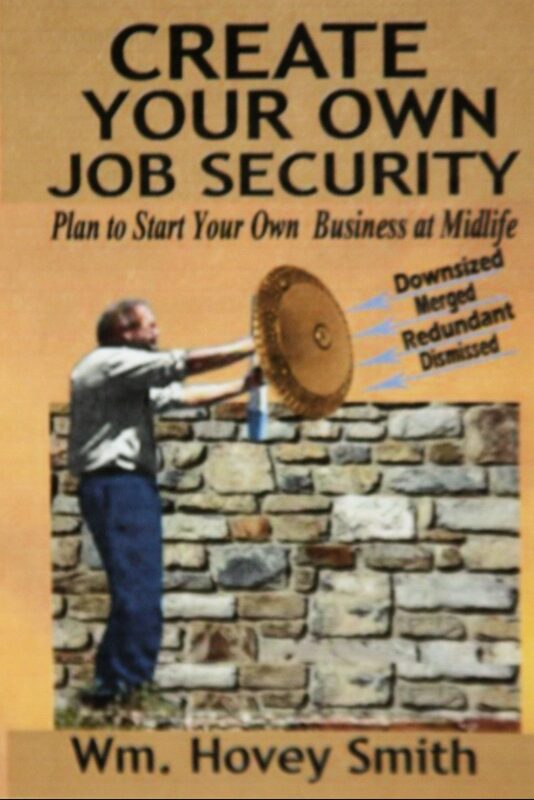 In my most recent book, Create your Own Job Security, I advocate that a person start businesses as and when they are needed as early as possible in life and become use to the concept of being an entrepreneur. Like clothing that might be changed each season, these businesses might be only to overcome a temporary difficulty, but will ultimately result in your discovery of your “business of passion.” That is, a business that you love to do so much that you would work at it even if no one paid you. This business could be in any field or take you in any direction. It will help you take your innate skills and talents and expand them. This business may involve linking with others. Together you may deriving a business concept that can not only get you through the immediate crisis, but also provide a longer term solution to permit you to stay where you are and not go through a disruptive move. It is difficult to come up with potentially viable business opportunities when under the pressure of having to pay next month’s rent, your kid’s college or medical expenses. Perhaps e-Bay sales, house cleaning or delivering pizzas can help – anything to get some money in the house. While taking on these temporary business opportunities, think about what you really always wanted to do and discover what you need to do to make that a reality. This need not be a store-front activity. Most likely it will start at your kitchen table, in your shed or maybe in an unused bedroom. The interconnectivity of e-commerce can permit you to reach a worldwide audience with your message, skills or products. What are they? Perhaps you have more than one concept, and you should think of developing many concepts so that you can systematically rank them and act to implement them at opportune times. If you have musical talents, express them. Learn to write, perform and record your own music. You can practice and perform by making your own YouTube videos. Don’t think so? At 77 I have over 725 videos on line right now and posted a new one just yesterday. Someone wants and needs to have the product that you made, the service you provide or the comfort that you can give. Find that audience, and you have found a business that you can start anytime, anywhere and run from where you are right now or anywhere else in the world. My new book helps you find and explore these opportunities, and I also offer individual consulting which may be arranged by using the contact block below. This service includes a 30-minute phone call where you discuss your choice of topic and a follow-up written report.